Tourette is a recent addition to my vocabulary. I first encountered the word in Josh Hanagarne’s autobiography The World’s Strongest Librarian, in which the author details his experience growing up in Utah as a Mormon librarian afflicted with Tourette Syndrome, and his journey of conquering the disorder by becoming stronger (literally, he became a competitive strongman). It’s really not the kind of thing you’d learn, say, at school. Tourette Syndrome is hereditary, not preventable by washing your hands and brushing your teeth, or being a good person. It’s a neurological disorder, not something self-explanatory like, shortsightedness, having a clubbed foot. It’s easy for us to acknowledge someone’s broken leg, and empathize with the injured, because the symptoms are tangible. With Tourette, it becomes abstract but all the more isolating. Still, it’s a concept you mostly observe from a distance, through the lenses of literature and anecdotal narratives. It’s different when you see it in the flesh. Gardiner Comfort’s tics, as he explains them in The Elephant in Every Room I Enter, at New York Theater Workshop’s new black box space, come in the form of coughing (he gives examples) that have nothing to do with having a cold. He describes having to explain time and again to strangers on the train insisting on offering him cough drops. He also describes the night terrors he experienced as a child. Can you imagine when terror becomes the norm? I shudder at the mere thought of it. The Elephant in Every Room I Enter was first presented at La MaMa in 2016. Now in its second installment, the show is a gift of earnest passion and fierce honesty. It gives you an unfiltered view into the awkwardness of living with Tourette. The co-creator/performer reveals every aspect of this strange disorder that he lives with in this energetic and moving production. Comfort details one week of his life when he attended the Tourette Syndrome Association National Conference in Washington D.C.
Comfort’s daily journal is also sprinkled with memories from his childhood. Growing up with a choreographer mother and the constant presence of dancers, he learns at an early age to counter his ticks with voluntary movements. It came natural to him. There’s a Tourette dance, a metamorphosis of erratic motions turning into grace and balance. Caite Hevner and Lianne Arnold’s video design also helps to illustrate the inner world of the performer, and strange outbursts become poetry: a leap like a desperate antler is an explosion of light, and then he’s running through psychedelic clouds. Those outbursts, homogenous to each individual afflicted with Tourette, cannot be translated into plain language. During the conference in D.C., Comfort found himself amidst a community he had never realized he was a part of. For the first time, he felt “it’s normal to have Tourette.” He describes the children he interacted with: the teenage “gentle giant” whose tick is grabbing and bear hugging people, and whose only way to calm down is drinking a large pot of black coffee or red bull, followed by a nap; the small child who has a knack for drumming and a distant look in his eyes. There are many more. Comfort imitates the various kinds of ticks in the conference room, and he becomes a one-man cacophony. And then, just as you start to worry that the performer might have lost control because of his condition, he stops and moves on to the next segment. The whole thing is a triumph of contradictions. The subject: a disorder that’s simultaneously constant and disruptive. 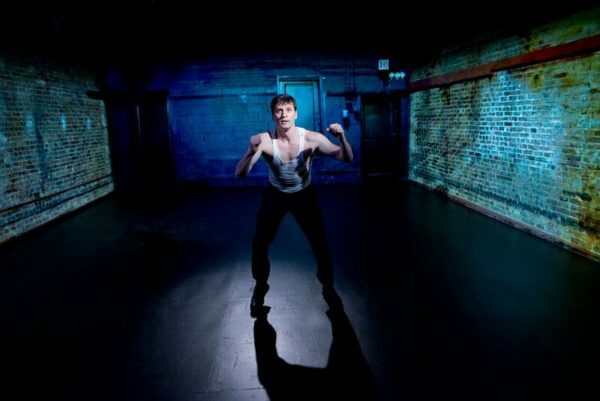 Having Tourette is having a perpetual fear of losing control, and yet, the actor becomes adept at keeping his tics at bay with the hyper specific performance art – acting is all about control. I think of riding a bicycle, or walking a tightrope: the only way to find stillness and balance is through constant movements. The strongman librarian from Utah one upped Tourette with cowbells and lifting inhumanly heavy stones; he got stronger than his Tourette; while the stage actor strengthened his muscles both physically and mentally. Gardiner Comfort became, I believe, faster, smarter, and more agile, than his hereditary disorder. The performer’s charisma and infectious energy also makes the production a worthwhile experience. It has the simplicity of an open mic session, but would burst into moments of absolute poetic abstraction with a flicker of light and a well-timed production. It beautifully captures the experience of one member of a marginalized community, and gives voice to a group of people whose problems we never knew how to comprehend. The Elephant in Every Room I Enter is an extraordinary feat of storytelling and a brave act of turning oneself inside out. It doesn’t normalize the disorder, but rather translate it into movements, stories, images, all of which are what expedite understanding. The Elephant in Every Room I Enter runs to November 25, 2017. More production info can be found here. To read Nicole Serratore’s interview with Gardiner Comfort for Exeunt in 2016, click here.